Example of IATA airport code printed on a baggage tag, showing DCA (Ronald Reagan Washington National Airport). c) as a means for the passenger and carrier to identify and trace a specific bag that has gone astray and was not delivered at the destination. The carriers' liability is restricted to published tariffs and international agreements. The first "separable coupon ticket" was patented by John Michael Lyons of Moncton, New Brunswick on June 5, 1882. The ticket showed the issuing station, the destination, and a consecutive number for reference. 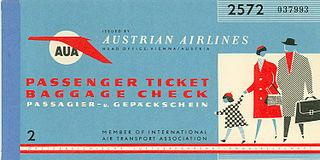 The lower half of the ticket was given to the passenger, while the upper half, with a hole at the top, was inserted into a brass sleeve and then attached to the baggage by a strap. At some point, reinforced paper tags were introduced. These are designed not to detach as easily as older tags during transport. The Warsaw Convention of 1929, specifically Article Four, established the criteria for issuing a baggage check or luggage ticket. This agreement also established limit of liability on checked baggage. Prior to the 1990s, airline bag tags consisted of a paper tag attached with a string. These tags became obsolete because they offered little security and were easy to replicate. Current bag tags include a bar code using the Interleaved 2 of 5 symbology. These bag tags are printed using a thermal or barcode printer on an adhesive thermal paper stock. This printed strip is then attached to the luggage at check-in, allowing automated sorting of the bags by bar code readers. There are two ways that bar code baggage tags are read: hand held scanners, and in-line arrays. In-line arrays are built into the baggage conveyor system and use a 360-degree array of lasers to read the bar code tags from multiple angles because baggage and the orientation of the bar code tag can shift as the bag travels through the conveyor belt system. One of the limitations of this system is that in order to read bar codes from the bottom of the belt, laser arrays are placed below the gap between two sections of conveyor belt. Due to the frequent build-up of debris and dust on these lower arrays, the rate of successful reads can be low. Frequently, the "read rate", the percentage of bar code tags successfully read by these arrays, can be as low as 85%. This means that more than one out of ten bar code baggage tags are not successfully read, and these bags are shunted off for manual reading, resulting in extra labor and delay. For flights departing from an international airport within the European Union, bag tags are issued with green edges. Passengers are eligible to take these bags through a separate "Blue Channel" at Customs if arriving at another EU airport. Bar codes cannot be automatically scanned without direct sight and undamaged print. Because of reading problems with poorly printed, obscured, crumpled, scored or otherwise damaged bar codes, some airlines have started using radio-frequency identification (RFID) chips embedded in the tags. In the US, McCarran International Airport has installed an RFID system throughout the airport. Hong Kong International Airport has also installed an RFID system. The International Air Transport Association (IATA) is working to standardize RFID bag tags. British Airways is currently[when?] conducting a trial to test re-usable electronic luggage tags featuring electronic paper technology. The passenger checks in using the British Airways smartphone app, then holds the smartphone close to the tag. The flight details and barcode are transmitted to the tag using NFC technology. Because the tag utilises electronic paper, the battery need only power the tag during the transmission of data. Fast Travel Global Ltd has developed a re-usable electronic luggage tag product called the eTag. This is also electronic paper-based but is not limited to a single airline. The passenger will check in using a supported airline's smartphone app and send the relevant flight information to the tag via Bluetooth Low Energy. Qantas introduced Q Bag Tags in 2011. Unlike the British Airways tags, they do not feature a screen, which means there is no barcode to scan. This has limited the use of the tags to domestic flights within Australia on the Qantas network. The tags were initially given free of charge to members of the Qantas Frequent Flyer program with Silver, Gold or Platinum status. The tags can also be purchased for A$29.95. Over the last years, there have been numerous of initiatives to develop electronic bag tags, by both independent technology companies as well as some airlines. The main benefits of electronic bag tags include self-control and ease-of-use by passengers, time-saving by skipping queues at the airport, improved read rates compared to printed bag tags and, as electronic bag tags are adopted, significant operational cost reduction for the airlines. The first company to successfully launch has been Rimowa in a partnership with Lufthansa in March, 2016. The concept of electronic bag tags has been gaining ground following that launch. On January 9, 2018, Lufthansa introduced a new electronic bag tag to their passengers, BAGTAG. BAGTAG is the first fully secure operational electronic bag tag that can be attached to any suitcase and has integrated radio-frequency identification technology. The first automated baggage sorting systems were developed in the 1980s by Eastern Air Lines at their Miami International Airport hub. Other airlines soon followed with their own systems, including United Air Lines, TWA, Delta, and American Airlines. None of these systems were interchangeable. In some systems, the bar code was used to represent a three-letter destination airport code, and in others it was a two-digit sorting symbol instructing the system at which pier to deliver the bag. As a result of the bombing of Air India Flight 182 on June 23, 1985, the airline industry, led by IATA, convened the Baggage Security Working Group (BSWG) to change international standards and require passenger baggage reconciliation. The Chairman of the BSWG, John Vermilye of Eastern Airlines, proposed that the industry adopt the already-proven license plate system. This concept used a barcode to represent the baggage tag number. At check-in, this number was associated with the passenger details, including flight number, destination, connection information, and even class of service to indicate priority handling. Working with Allen Davidson of Litton Industries, with whom Eastern had developed the license plate concept, the BSWG adopted this system as the common industry standard for passenger baggage reconciliation. Initially the barcode, or license plate, was used to match baggage with passengers, ensuring that only the baggage of passengers who had actually boarded the flight were carried onto the aircraft. This standard was adopted by IATA Resolution in 1987. By 1989, the license plate concept was expanded to become the industry standard for automated baggage sorting as well. The barcodes were enlarged to facilitate automated reading. The barcode was shown in two different orientations or in a "T" shape, called the "orthogonal" representation. The term license plate is the official term used by the IATA, the airlines, and the airports for the ten-digit numeric code on a bag tag issued by a carrier or handling agent at check-in. The license plate is printed on the carrier tag in barcode form and in human-readable form (as defined in Resolution 740 in the IATA Passenger Services Conference Resolutions Manual, published annually by IATA). The license plate is the index number linking the Baggage Source Message (BSM), sent by a carrier's departure control system, to the airport's baggage handling system. This message (BSM) contains the flight details and passenger information. Each digit in the license plate has a specific meaning. The automated baggage handling system scans the barcodes on the carrier tags and sorts the bags accordingly. Both the license plate number and the BSM are essential for automated sorting of baggage. The human-readable license plate will have either a two-character or a three-digit IATA carrier code. For example, it may be either "BA728359" or "0125728359." "BA" would be the two-character IATA code for British Airways), and "125" would be the three-digit IATA carrier code. Nevertheless, the barcode will always be the full ten digits. The first digit in the ten-digit license plate is not part of the carrier code. It can be in the range of zero to nine. Zero is for interline or online tags, one is for fallback tags, and two is for "rush" tags. Fallback tags are pre-printed or demand-printed tags for use only by the airport's baggage handling system. These tags are used when there is a problem in communication between the carrier's departure control system and the airport's baggage handling system (as defined in IATA Recommended Practice 1740b). A "rush" bag is a bag that missed its original flight and is now flying unaccompanied. The purpose of numbers in the range of three to nine is not defined by the IATA, but they can be used by each carrier for their own specific needs. The first digit is commonly used as a million indicator for the normal six-digit tag number. Wikimedia Commons has media related to Bag tags. ^ "international airport within the European Union" (PDF). europa.eu. ^ "BA testing luggage tags made of electronic paper". BBC News. ^ "Fast Travel - eTag, CHECK YOUR BAGS IN AT HOME. BYPASS THE QUEUES!". www.fasttravel.global. ^ "FastTrack's Vision for Smart Luggage—And Happier Flyers". www.iotjournal.com. ^ "The Q Bag Tag - Qantas". qantas.com.au. ^ "RIMOWA - Electronic Tag". rimowa-electronictag.com. Retrieved May 1, 2018. ^ "Lufthansa set to roll out RIMOWA Electronic Tag". Future Travel Experience. March 11, 2016. Retrieved May 1, 2018. ^ "Lufthansa Group rolls out electronic bag tags with BAGTAG partnership". Future Travel Experience. January 9, 2018. Retrieved May 1, 2018. ^ "BAGTAG". BAGTAG | the ultimate device for travel with your baggage. Retrieved May 1, 2018. ^ IATA Passenger Services Conference Resolutions Manual (PSCRM), 33rd Edition, Resolution 740, Secrion 5.1.2; however, this source does not reference how airlines commonly use that digit. It only states that values three through nine are for "interline and on-line use". Lost luggage is luggage conveyed by a public carrier such as an airline, seafaring cruise ship, shipping company, or railway which fails to arrive at the correct destination with the passenger. In the United States, an average of 1 in 150 people have their checked baggage misdirected or left behind each year. In airport terminals, a baggage reclaim area is an area where arriving passengers claim checked-in baggage after disembarking from an airline flight. The alternative term baggage claim is used at airports in the USA and some other airports internationally. Similar systems are also used at train stations served by companies that offer checked bags, such as Amtrak in the United States. Baggage or luggage consists of bags, cases, and containers which hold a traveller's articles while the traveler is in transit. A boarding pass is a document provided by an airline during check-in, giving a passenger permission to enter the restricted area of an airport and to board the airplane for a particular flight. At a minimum, it identifies the passenger, the flight number, and the date and scheduled time for departure. In some cases, flyers can check in online and print the boarding passes themselves. A boarding pass may be required for a passenger to enter a secure area of an airport. An electronic ticket is the digital ticket equivalent of a paper ticket. The term is most commonly associated with airline issued tickets. Electronic ticketing for urban or rail public transport is usually referred to as travel card or transit pass. It is also used in ticketing in the entertainment industry. 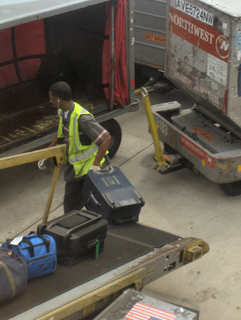 In the airline industry, a baggage handler is a person who loads and unloads baggage, and other cargo for transport via aircraft. With most airlines, the formal job title is "fleet service agent/clerk", though the position is commonly known amongst airline employees as a "ramp agent", due to the job's location on the airport ramp (tarmac). The term hand luggage or cabin baggage refers to the type of luggage that passengers are allowed to carry along in the passenger compartment of a vehicle instead of moving to the cargo compartment. Passengers are allowed to carry a limited number of smaller bags with them in the vehicle and contain valuables and items needed during the journey. There is normally storage space provided for hand luggage, either under seating, or in overhead lockers. Trains usually have luggage racks above the seats and may also have luggage space between the backs of seats facing opposite directions, or in extra luggage racks, for example, at the ends of the carriage near the doors. A baggage handling system (BHS) is a type of conveyor system installed in airports that transports checked luggage from ticket counters to areas where the bags can be loaded onto airplanes. A BHS also transports checked baggage coming from airplanes to baggage claims or to an area where the bag can be loaded onto another airplane. Airport check-in is the process whereby passengers are accepted by an airline at the airport prior to travel. The airlines typically use service counters found at airports. The check-in is normally handled by an airline itself or a handling agent working on behalf of an airline. Passengers usually hand over any baggage that they do not wish or are not allowed to carry in to the aircraft's cabin and receive a boarding pass before they can proceed to board their aircraft. Disney's Magical Express is a private ground transportation and luggage service delivery for Walt Disney World Resort operated by Mears Transportation. The service is complimentary and is only available to guests with reservations at one of the Walt Disney World Resort hotels.